Mr. Jones is a grump. He does not like people. He does not like animals. He does not even like children, come to think of it! One day he suddenly discovers a non-expecting visitor in the garden. What should a grump do then? Mr. Jones has a visitor is a lively book about friendship and how life can be turned upside down by a giant elephant in his own garden. The story tells about little Alfred and the elephant called Gift, and how life might change for a grumpy old man. 40 pages. Format 23,5 x 29,5 cm. Suitable for children from 3 to 6 years. Elisabeth Moseng (born 1967) is an illustrator, designer and author. She has got a degree in Art Direction from Westerdals Oslo ACT and a BA in illustration from Kingston University in London. Moseng has illustrated a wide range of books for children. She is well-known for her playful and expressive style, and she describes herself as an illustrator with a graphic expression. Moseng has received a many diplomas for “The Year’s Most Beautiful Books”. 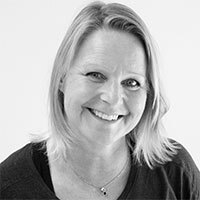 In 2014 Moseng made her debut as an author with her picture book When I become a big brother (Når jeg blir storebror), a funny and clever book for young children about all the changes that will take place when you get a baby brother or a baby sister. 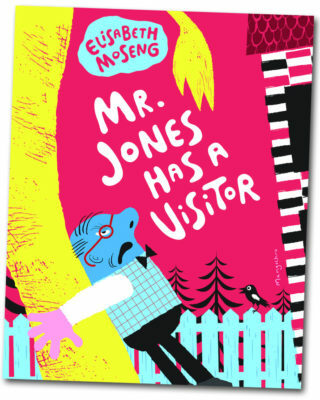 Now she is back with the exciting and expressive picture book Mr. Jones has a visitor. Forrige Forrige innlegg: Camilla Otterlei and Lene Ask: HELLO, LITTLE ONE! Neste Neste innlegg: Bente Bratlund and Rui Tenreiro: WHERE’S SCRUFF ?